Photographs from Palmyra taken in 2007 by artist and architectural designer Mark Pimlott are part of his wide archive documenting our surroundings and the human impulse. These images show the remains of rare Roman architecture, now destroyed by fanatic iconoclasts. Palmyra is featured in Pilmott’s installation World (2012), situated outside the BBC’s New Broadcasting House. His piece names 750 sites of international significance and encourages viewers to consider the interplay between the seemingly random locations. Can you describe the atmosphere and what was most special about Palmyra? To get to Palmyra, you have to drive across the desert. Along the road from Damascus, in the middle of the broad valley of the desert north of the city, a pale landscape, one finds the otherworldly roadside ‘Baghdad Cafe’. We approached Palmyra at the end of the afternoon; an oasis, with the ruins of the ancient city just beyond. The ruins are laid out on the plain, protected by the fortress of hills to the west and its sentinel funerary towers. The cardo and decumanus, remnants of a triumphal arch, as well as traces of walls of houses fill the valley like the desiccated carcass of a great city. Stones and landscape are tan and golden, the sky a flat and wan blue. Standing out from this field of stranded colonnades are the fabulously detailed temples of Bel and Baal-shamin – almost perfect, fabulously detailed. The detail is surprising; crisp and elaborate. In the case of Bel it is monstrous in scale, as is the case of the great Roman ruins at Apamea, Bosra and Baalbek. The scale seems to have been increased in the colonies to be even more impressive. Was your trip part of a longer journey? I was visiting diplomatic friends based in Damascus, in April – May 2007. We saw Bosra, Apamea, the Dead Cities, Palmyra; and in Lebanon, the ruins of Aïn Anjar and Baalbek. Unfortunately, I had to leave the trip early and did not see Krak Chevalier or Aleppo, much to my eternal regret. 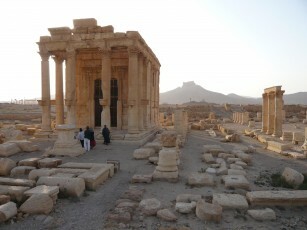 Could you compare Palmyra and its significance to anywhere else? Palmyra is as important as any of the very great architectural sites of the ancient world, and it is particularly significant as a site where trade routes and others came together and were welcome. Different gods are all accommodated here. It is a model for what our society used to have the ambitions to be. Therefore it should be considered as a most respected site. ISIS are perfectly aware of what they are destroying, and demonstrating our incapacity to act. Can you imagine any possible strategy to protect from the threat of further damage if the unrest continues? Actions rather than mealy-mouthed promises might help. ISIS and its agents are determined to destroy civilisation in favour of a realm without time, a tabula rasa that is merely a waiting place for their redemption. To them, everything other is an abomination, apostasy, heresy. This will only stop if civilisation, or ISIS, is annihilated.